President Donald Trump, left, talks to Turkish President Recep Tayyip Erdogan, right, as they tour the new NATO headquarters in Brussels, Belgium, July 11, 2018. U.S. Deputy Assistant Secretary of State David Satterfield meets with Lebanese Prime Minister Saad Hariri, in Beirut, Lebanon, March 5, 2019. 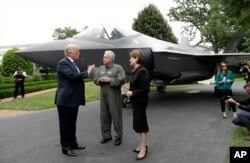 President Donald Trump talks with Lockheed Martin president and CEO Marilyn Hewson and director and chief test pilot Alan Norman in front of a F-35 as he participates in a "Made in America Product Showcase" at the White House, July 23, 2018. 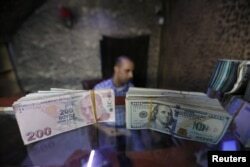 Banknotes of U.S. dollars and Turkish lira are seen in a currency exchange shop in the city of Azaz, Syria, Aug.18, 2018. Turkey's President Recep Tayyip Erdogan, center, Turkey's Economy Minister Berat Albayrak, right, who is also his son-in-law, meet with Jared Kushner, left, U.S. President Donald Trump's adviser and son-in-law, at the Presidential Palace in Ankara, Turkey. Some analysts warn that Washington has already run out of time. 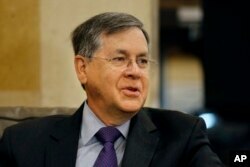 "The S-400s will be delivered; the question is not delivery," said Bagci. "But the question is: Is it going to be used? It could be deployed to Turkish Cyprus, so it's not in Turkey. In Turkey, every home has a guest room. So the S-400 could be like a vase in the guest room, not used."